In a departure from most of the home tours I write about on this blog, today I'm going to show you around a house, rather than a flat! The vast majority of nice homes I come across seem to be studios, so it makes a pleasant change to write about something slightly different. It is still in Stockholm, though, so not that much of a change. I'm so impressed with how closely they've matched all the different shades of wood. Experience has taught me that it's really, really hard to make all of your wooden furniture consistent in colour, especially when you're also constrained by price and dimensions. 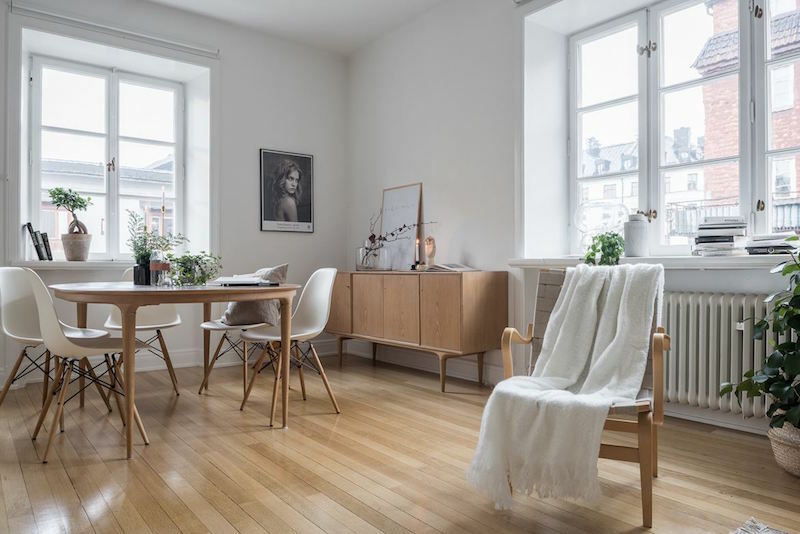 Not only have they found matching dining chairs, dining table, armchair and sideboard, everything is also only a couple of shades away from the floor. That's some serious skill. Eames DSW side chairs: £339, Utility Design (original) or £49, Cult Furniture (replica). 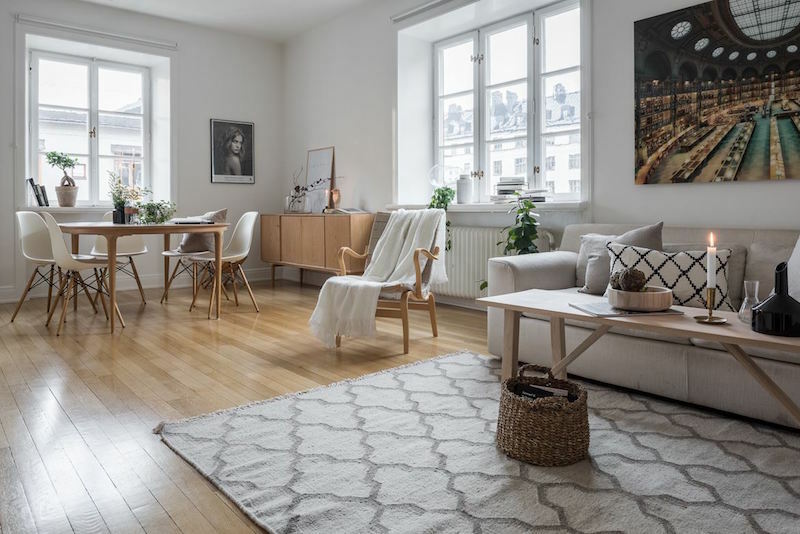 Similar rug: from £99, The Rug Seller. I love these bookshelves, too, and the way they frame the sideboard. I stared at this image for a few seconds trying to work out how I could make my shelves look that nice, before realising that they've turned most of their books the wrong way round. Not sure the colour consistency is worth being completely unable to pick out what you wanted to read. Plus my friends would relentlessly make fun of me if I did something like this in my flat. But it does look nice! Brown paper bag planter: $24, Uashmama. Similar bedside table: £101, HAY. Similar cushion (on chair): £35, Ross & Brown. Similar ceiling lampshade: £7, IKEA or £260, Mika Barr.